As Spurs prepare to move into their new home, Nike’s latest designs are ushering in a brand-new era. It’s an exciting time to be a Tottenham Hotspur fan. Under the guidance of Mauricio Pochettino, Spurs have finished inside the Premier League’s top four for the past three years in a row, while the emergence of Harry Kane has even encouraged fans to dream a little bigger. For years, Spurs were a comfortable mid-table team that never even dreamt of challenging for the title, with just two League Cup triumphs to show for the last 20 years. But this is a different Spurs. This is a different era. No matter what happens on the pitch, the 2018/19 season will go down as a landmark year for the London club. After over 100 years at White Hart Lane (and an interim season at Wembley), Spurs are finally moving into their new home, as they write a fresh new chapter into their astonishing history. So, it’s fair to say that excitement is pretty high in North London right now, while it looks as though Liverpool will be the first visitors to their new home on 15th September. Not a bad opening game, eh? If that wasn’t enough, then the new stadium has even been a huge inspiration for their 2018/19 football kits. Unleashed earlier this week, Nike’s latest designs pay homage to the club’s new stadium, with both the home and away kits referencing the architecture of the new ground. Of course, Nike have stuck by the traditions of the club, and the 2018/19 home kit provides the usual combination of lily white and dark navy. But this time the navy is much more prominent, coming in the form of a graphic across the front of the shirt, and then continuing across the shorts and socks. Offering a strong gradient effect, the new home shirt comes complete with subtle detailing to reference the new ground: with the club’s post code and stadium co-ordinates stitched on the inside. You’ve got to say that there are some really nice touches from Nike, while the away shirt also taps into the loyalty and devotion of the club’s fans. COYS: the new away kit honours the loyal support of the club’s fans. Image by Nike. The phrase #COYS can be found inside the away shirt, as Spurs look set to show off a beautiful binary blue kit on their travels next season. 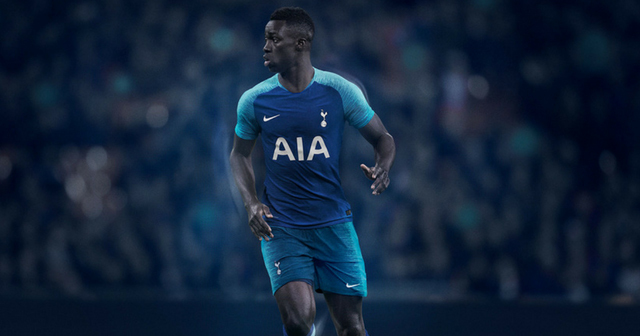 Coming complete with blue knit sleeves and yet another gorgeous gradient pattern, the away kit joins a long list of other stunning blue strips worn by Spurs down the years, while also giving one huge nod towards the future. 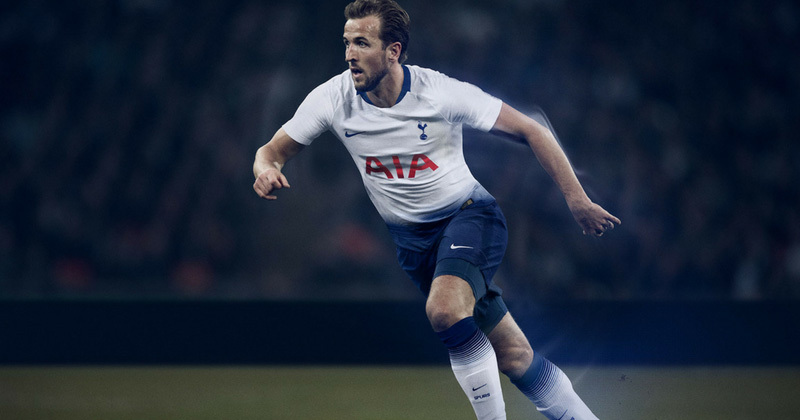 There’s plenty to be optimistic about over at Tottenham Hotspur this season, and we expect to see their new football kits start flying off the shelves. Make sure to compare prices at FOOTY.COM to find the best deals on the internet- and gear up for the new season at a fraction of the usual cost.